Catherine, the Duchess of Cambridge (2nd R), watches as a young surf lifesaving competitor crosses the finish line during her visit to a surf lifesaving demonstration alongside former Australian surf lifesaving team member Chris Allum at Sydney's Manly Beach on April 18, 2014. 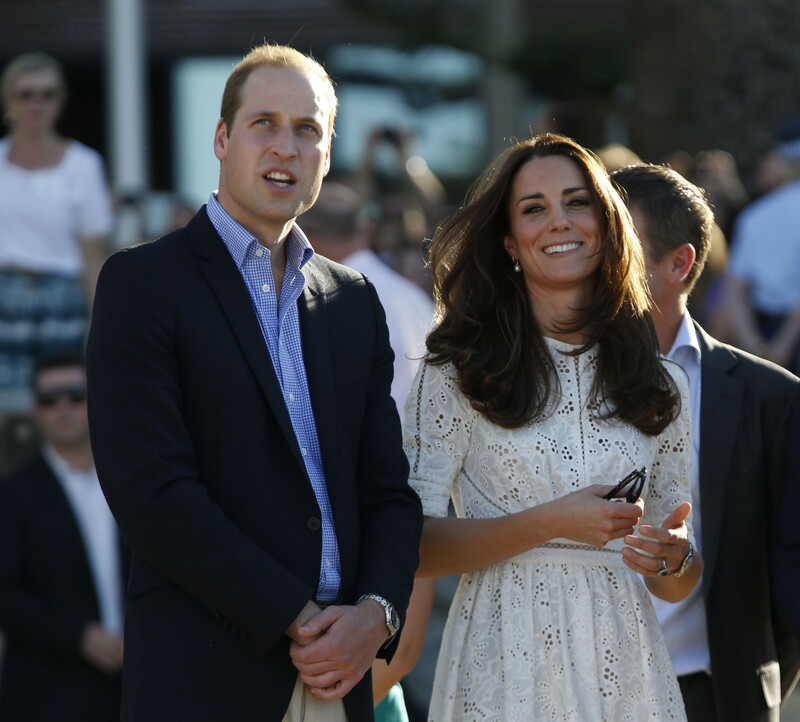 SYDNEY - Britain's Prince William and his wife Kate got to grips with Australia's beach and bush lifestyles on Friday, watching a life-saving display and a sheep-shearing demonstration as part of their tour Down Under with baby son George. 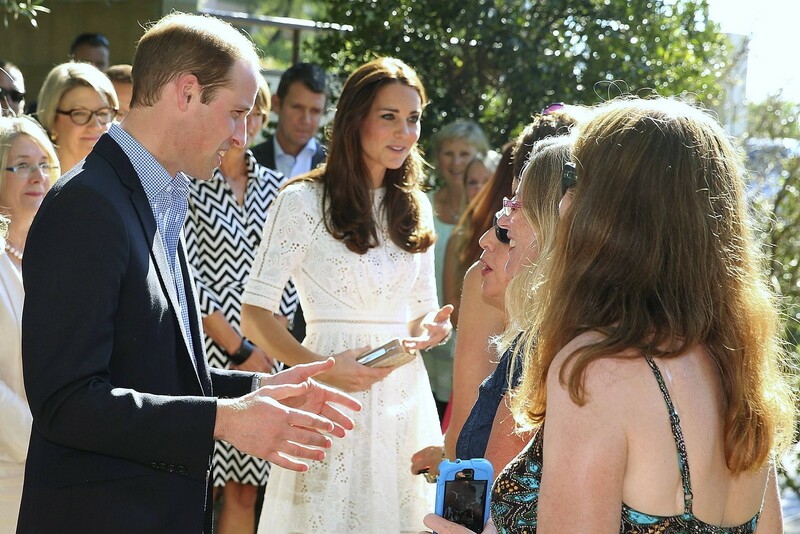 The young royals have received a warm welcome in Sydney, the first stop of their 10-day Australian tour, with thousands flocking to their official reception at the Sydney Opera House on Wednesday. 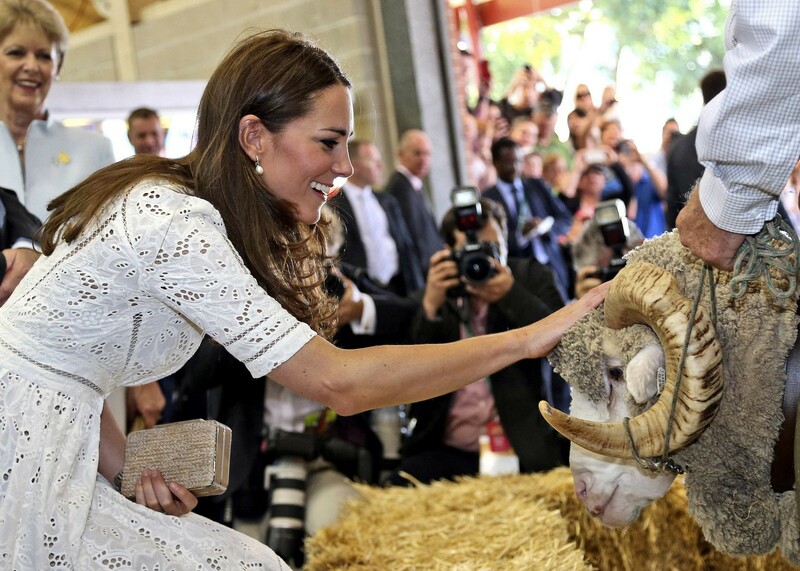 Thousands more craned for a glimpse of the Duke and Duchess of Cambridge at the Royal Easter Show on Friday, where the glamorous couple viewed agricultural exhibits. Kate, who was wearing a cream cotton lace dress by Australian brand Zimmerman, joked while inspecting an alpaca wool display that her husband's thinning hairline could do with some help from the fleece. "She pointed at him and said, 'You need it more than me.' He laughed," said Ms Lyn Cregan, 67. The pair are popular in Australia - where William's grandmother Queen Elizabeth II is head of state - and have been lavished with bouquets and gifts from the crowds, including many for eight-month-old George, who also travelled with them to New Zealand. "They're such a lovely couple. They're so much in love," Ms Margaret Bryant from the country town of Cowra told the Australian Associated Press, having arrived in Sydney at 3am to see the royals. In her first speech of the visit, at the children's hospice Bear Cottage, Kate expressed gratitude for the warm welcome she and George have received on their first visit to Australia. "To be here together as a family has been very special and we will always remember it with fond and happy memories," she said. The Duchess also praised Bear Cottage, describing its work as "inspirational". It was then to Manly Beach where Sydney put on perfect autumn sunshine for a demonstration of surf life-saving. Britain's Prince William and his wife Kate got to grips with Australia's beach and bush lifestyles on Friday, watching a life-saving display and a sheep-shearing demonstration as part of their tour Down Under with baby son George. Kate, who was wearing a cream cotton lace dress by Australian brand Zimmerman, joked while inspecting an alpaca wool display that her husband's thinning hairline could do with some help from the fleece. "She pointed at him and said, 'You need it more than me.' He laughed," said Ms Lyn Cregan, 67. "To be here together as a family has been very special and we will always remember it with fond and happy memories," she said. The Duchess also praised Bear Cottage, describing its work as "inspirational". Close to 100 "nippers" - junior life-savers in training - competed in beach races, swimming and board events, with Kate firing the gun for one of the races. 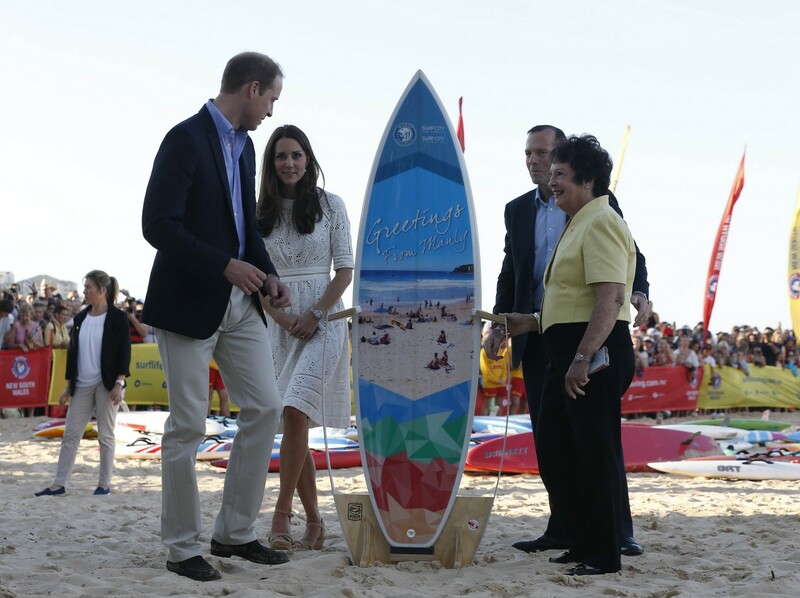 The couple were presented with a six-foot surfboard for George. But the royal couple didn't get any sand between their toes - choosing to keep their shoes on, in Kate's case a pair of wedge heels. The move made news in Australia, prompting the headline in Sydney's Daily Telegraph: Royal couple hit the beach but shoes stay on. The Daily Mail called it "Kate's Baywatch moment." 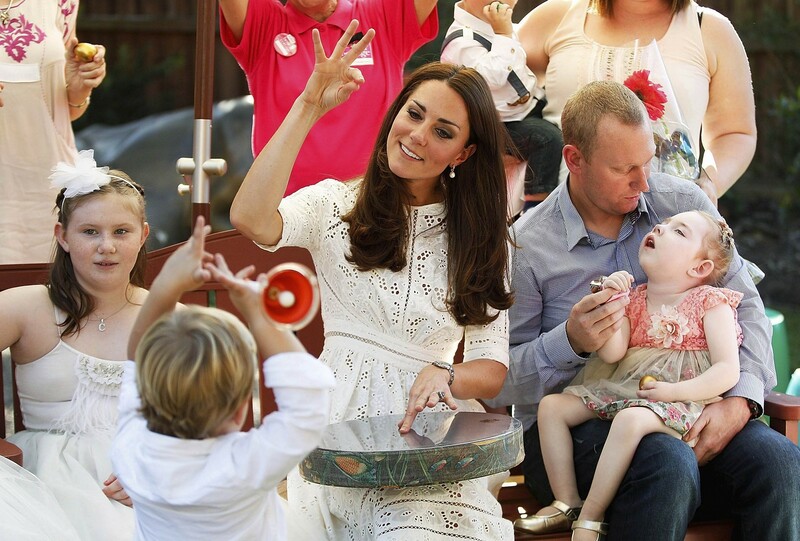 The Duchess, 32, reportedly kept her wedges on throughout the 40 minute long engagement. The Duchess of Cambridge managed to stay steady as she ran across the sand on Manly beach in her wedges. The Daily Mail reported that Kate refused to wear flats despite being advised to do so by event organisers. 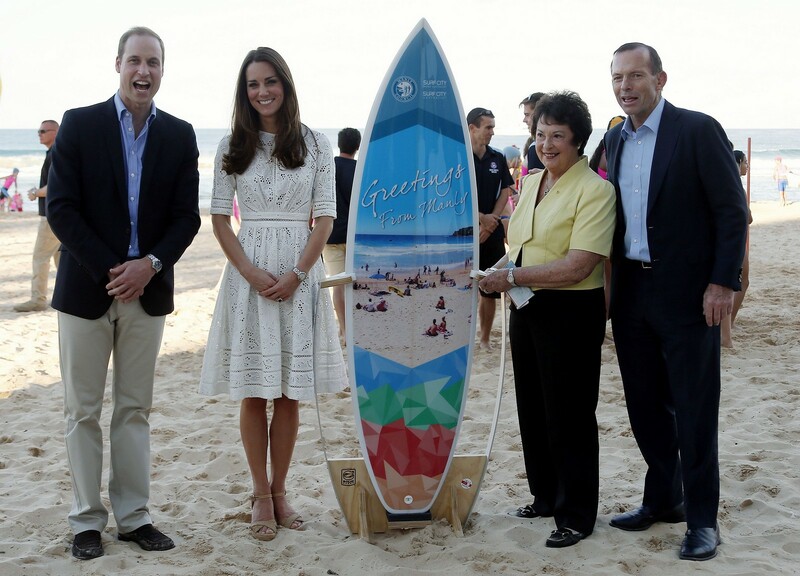 The Duchess's appearance on Manly Beach had a serious side as she was helping to promote Australia's Surf Life Saving Clubs. A member of the crowd stands on a pole to try and see Catherine, the Duchess of Cambridge, and her husband Britain's Prince William, as the royal couple watch a junior surf lifesavers display during a visit to Sydney's Manly beach April 18, 2014. Local resident Giovanni Testini was one of the many in the crowd with a gift for the royals - in his case, a pair of miniature 'budgie smugglers', men's swimming briefs, for George. The royals, who have just completed a 10-day tour of New Zealand, will travel to Queensland on Saturday as part of a trip that will also take them to Uluru (Ayers Rock) in Australia's desert heartland.